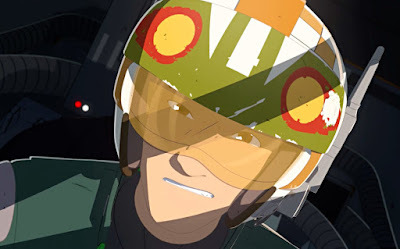 We're just over two weeks away from the premiere of Star Wars Resistance, the new animated series debuting on Disney Channel on October 7th, 2018 at 10pm with the two-part episode "The Recruit". Now, the episode titles for the next three episodes have been revealed online by TV Wunschliste, and was first picked up by the German Star Wars fansite Jedi-Bibliotek. The next three episodes will called, "The Triple Dark", "Fuel For The Fire", and "The High Tower", and they will air on October 14th, 21st, and 28th, respectively. Star Wars Resistance premieres October 7th at 10pm on Disney Channel and stars Christopher Sean (Days of Our Lives), Suzie McGrath (East Enders), Scott Lawrence (Legion), Myrna Velasco (Elena of Avalor), Josh Brener (Silicon Valley), Donald Faison (Scrubs), Bobby Moynihan (Saturday Night Live), Jim Rash (Community), Stephen Stanton (Rogue One), Mary Elizabeth McGlynn (Star Wars Rebels), and Rachel Butera (Tammy’s Tiny Tea Time). The series is executive produced by Dave Filoni Athena Portillo, Justin Ridge, and Brandon Auman.